When Oksana relayed this news to me, my first thought was, “Wait a minute… Juneau doesn’t have a subway system!” Oh, but yeah… They do have a sandwich shop franchise down there. Well, at least that explained the hazy smoke we’d been seeing all day. When Oksana hung up the phone, it was still only about 8:30pm and she wanted to go check it out. I thought it might be interesting to see the damage before the results of the inevitable cleanup. I know firsthand how tragic a fire can be, but there’s no denying that there’s a certain allure to observing the scene of an accident. We grabbed her camera and headed in to town. It was obvious by the time we rounded Fred Meyer’s that the rumors were not unfounded. In the distance, downtown Juneau was completely obscured by a thick layer of smoke. 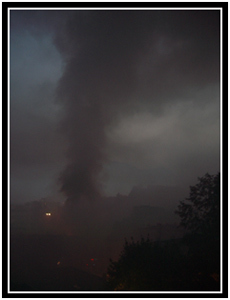 The day had been hot and the air still enough that the smoke still hugged the ground. It was amazing that any smoke made it all the way out to Auke Bay, really. 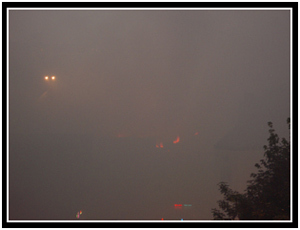 As we approached town, the smoke got thicker and we began to smell it in the car. When we rounded the corner by the Prospector and saw how dense it was downtown, my plans changed from driving down the street next to Subway to just turning around and getting out of there. Unfortunately, we were in traffic and when we reached the stoplight next to the Wharf, we were detoured away from Main Street. My righteous indignation flared – we recognized the danger and the impact our rubbernecking would have on the already overstressed firefighters; that was exactly why we were turning around to get out of there. What was his problem? Despite not wanting to get underfoot, we still wanted to see what was going on. Could the fire still be burning after 6 and a half hours? We decided to park the car at Centennial Hall and hoof it on foot. We knew that a police car was diverting traffic away from the intersection of Main and Egan, but we didn’t know if they were also turning away pedestrians. Judging from the toxic cloud hanging over downtown, we figured they were. Our best bet was to walk up the stairs next to the State Office Building to try to see the site from above. When we arrived at the top of the stairs (winded from sucking in so much smoke) we noticed another police car blocking access to Main Street from the Capital Building intersection. There was police tape up and it wasn’t obvious if they were letting pedestrian traffic through there, either. Three blocks away, we could just make out a column of smoke billowing upwards. The fire was indeed still burning. Oksana and I decided to walk towards Amelia’s house, which sits up on the hillside looking out over Juneau. We meandered through the empty streets and found ourselves within the cordoned off area at times. We stopped only briefly to take a few pictures of the smoky, deserted streets. Off in the distance we could hear the constant clanging of some building’s fire alarm. As we climbed up over Franklin Street, the smoke cleared enough for us to breathe a little easier. We soon found ourselves among a few onlookers looking down on the fire from a small parking lot. There wasn’t much to see. 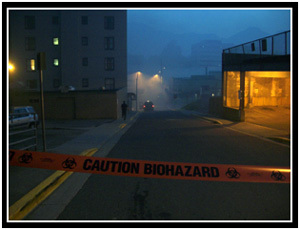 Climbing from the thick haze covering all of downtown Juneau was a huge column of black smoke. Below, at the epicenter, we could make out only three or four things: The circling lights of a fire engine, a set of neon bar signs hanging in the window of the Imperial, two powerful lights mounted high on an extended fireman’s ladder, and, alternately surging and waning, orange flames licking at the windows of an unseen building. I took some pictures and we listened to the downtown residents around us speculate what had caused the fire (the consensus seemed to be a kitchen fire at the Dragon Inn). We heard explosions rock the building and the ensuing rain of debris into the streets caused one onlooker to complain about not being able to remove his car from across the street. From the first glimpse, it was obvious to us – even without ever being able to see the building – that the firefighters were now working only to save the surrounding properties. Fifteen minutes or so passed before we came to the conclusion that we were not going to see anything new. The fire was far from being under control and breathing in the toxic fumes wasn’t very pleasant. We decided to walk back the way we’d come and head on home. We toyed with the idea of entering the cordoned-off zone to get a better look, but I thought back to the fireman who’d scolded us for making a U-turn. They were under enough stress trying to put out the fire and they didn’t deserve the added burden of safeguarding two more rubberneckers. 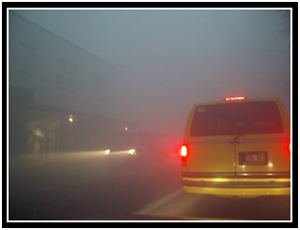 We got back to our car, started it up, and quickly drove out of the smoke haze. Once we passed the Douglas Bridge, we rolled down the windows and aired out the car. We could breathe freely again, but anyone coming within 10 feet of us could tell you that we still needed to wash our clothes ASAP. Early this morning, I checked online for the real story. Rumor has it that the crew tarring the roof was responsible for the fire. The Juneau Empire significantly mentions that they spent 15 minutes trying to put out the fire themselves before calling the fire department. I wonder if they’re going to end up being sued for damages. I sure hope all those businesses had fire insurance. Pretty amazing for sure. To add to the rumors/explanations, I heard from a JPD Volunteer that the fire was started by at 19-20 year old troublemaker kid – using a blowtorch directly on the 2 inches of tar roofing. I don’t know if that works in conjunction to the Empire’s explanation, but it seems they could be combined. I don’t have much reason to doubt the nice lady with a radio and experience with troublemaking Juneau youth. Additionally, I sent a note to KINY Radio asking if there were efforts being coordinated for physical or financial support of the victims of the fire – it’s been 18 hours and I haven’t heard back, I’m sure they’re busy.